What we found upon reaching the mission proved disturbing beyond what we had imagined. “When we came in, I could feel the ancestors,” Walk leader Caroline Holland said. “I got here and started looking around and it just hit me. Like no, something’s wrong. There’s something big here, something terrible has happened here.” Gradually, the story began unraveling. 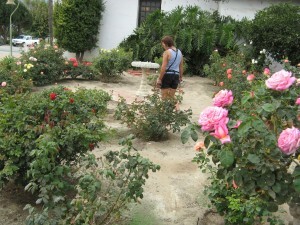 Like all the other missions, Soledad is operated as a tourist destination. Though it’s owned by the Diocese of Monterey, the grounds and visitor center are maintained by a nonprofit organization, the “Soledad Community Mission Fiesta, Inc.” Speaking with the docent on staff, we asked where the Native American graves were located. “There’s no burials here, they’ve all been removed.” she said. To where? She said she didn’t know. We sought further information, locating Carlene Bell, a director of the Soledad Community Mission Fiesta. “That’s not true. We just don’t know where they are,” she said. When asked why they do not conduct a study—working with the local tribes—to determine where the burials are and so they can acknowledge and respect them, she replied that they don’t want to look for the burials because they don’t want to dig them up. We pointed out that of course, there are many ways to determine the location of human remains without disturbing the soil, such as ground-penetrating radar, which was recently employed at the site of Mission Santa Cruz. 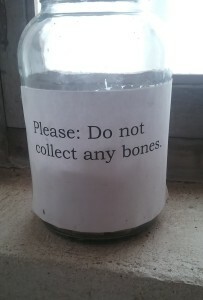 A docent responded to our distress about children playing with bone fragments by telling us that there was a sign inside the visitor center that told people not to collect the bones— and their parents “should have read it.” We eventually located the tiny sign, taped on to a mason jar on the window sill of the “Native American” room— it reads “Please: Do not collect any bones.” The jar appears to contain bone fragments and pottery shards. 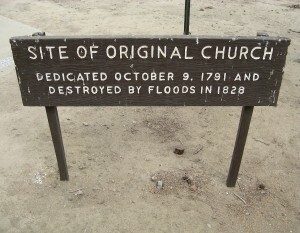 At every other mission, there is a cemetery with thousands of baptized Native Americans buried en-masse adjacent to the chapel. Why would Soledad be any different? The situation is muddled somewhat by a lack of exact numbers of burials, because apparently, Soledad is the one mission for which the burial records have been lost. According to the Early California Population Project, Between 1791 & 1850, 2,208 baptisms were recorded at Soledad, and 78 of these individuals have burial records at other missions. 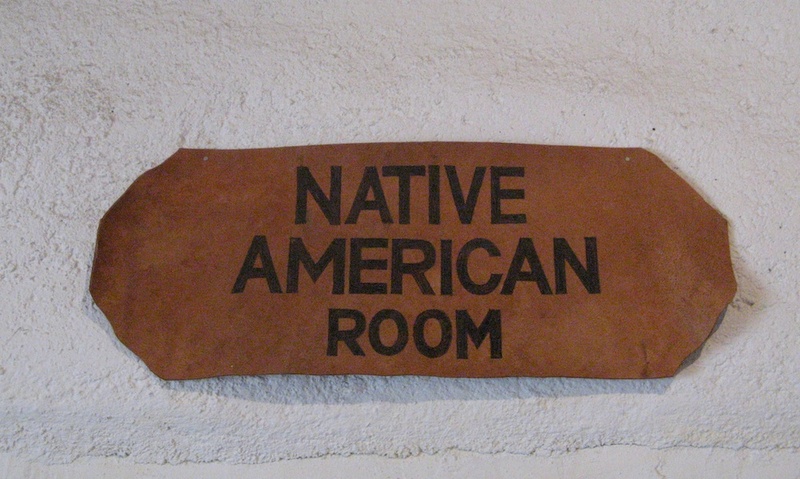 Based on these numbers and other reference points, UCSC PhD candidate researcher Martin Rizzo posits the educated guess that roughly 1,750 Native Americans were buried at Mission Soledad. 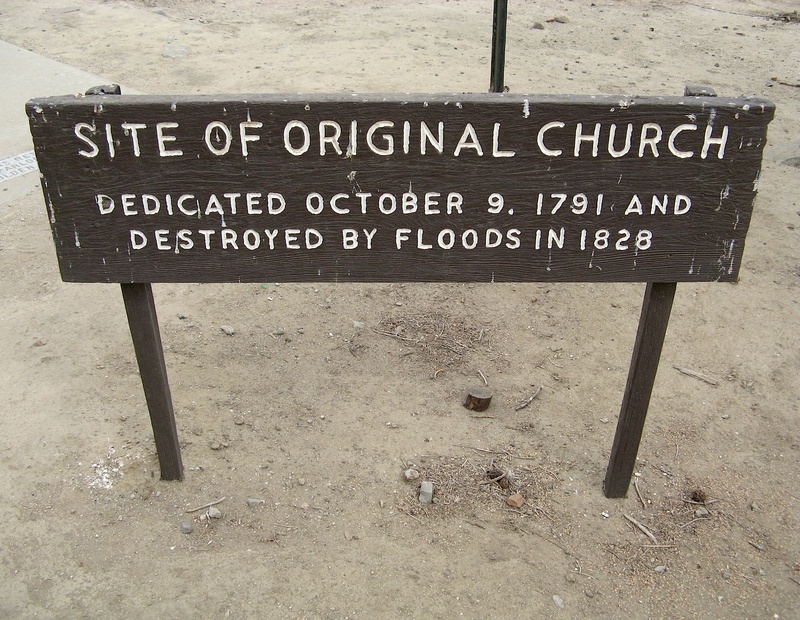 Most of the Soledad mission buildings were destroyed in the early 19th century when the Arroyo Seco and Salinas Rivers flooded the area on three separate occasions. The Chapel and South Wing buildings have been reconstructed and efforts are underway to restore other sections of the original structures, at significant expense. Archeological work is being been conducted as part of the planning for reconstruction efforts. And yet, there is still no acknowledgement whatsoever of the burial ground and the mass grave of indigenous people on the premises. Mission Soledad was built near the boundary between Chalon Ohlone and Esselen ancestral lands, likely on or near the site of the Esselen village of Chuttesgilis. 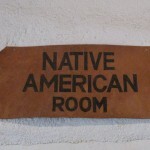 Yet in the mission’s tenure between 1791 and 1834, in addition to Esselen and Chalon Ohlone people, Salinan and Yokuts-speaking people were brought to the mission from the south and east. Thus, indigenous ancestors from at least these four language groups were enslaved at Soledad and are buried on the premises. We explained to the docent that due to this fact, proper consultation regarding the handling of ancestral remains and cultural resources should involve the leadership of the descendants of these four tribal language groups. We spoke with local Esselen, Salinan & Ohlone representatives in the course of asking permission to come through their territories. All three of the leaders we spoke to indicated that despite their efforts, Soledad Mission continues to refuse to work with them. When driving in to Soledad, a big, enigmatic sign reads “It’s happening in Soledad!” One always looks around and wonders what they’re talking about. In visiting the mission, we learned of one thing that is NOT happening in Soledad: respectful acknowledgement of the indigenous ancestors who suffered and died under the reign of the mission system. Or any real expression of truth in history. 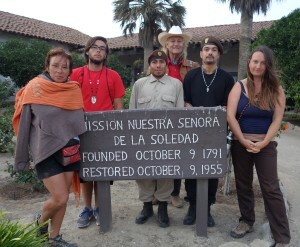 In the words of Chochenyo Ohlone community leader Corrina Gould, “the missions were the first prison system in California.” Under the bell of the Soledad mission, Indians were forced to labor in the vineyards and vast agricultural fields, which were watered seasonally by a 15-mile aqueduct that they also toiled to build. 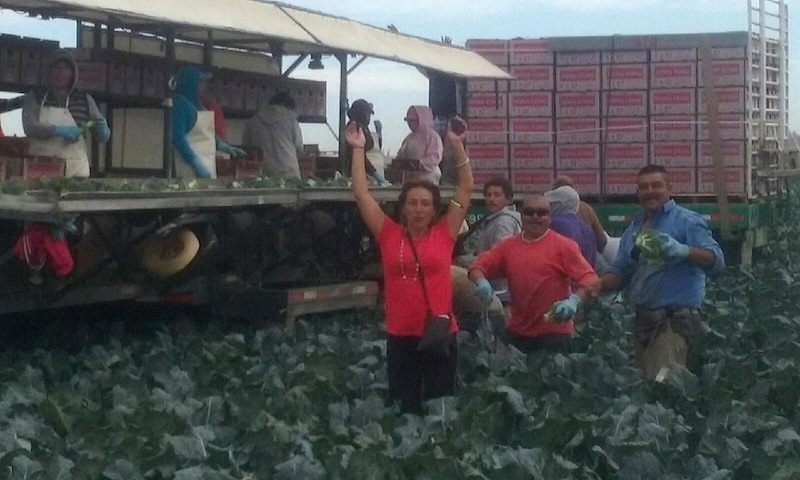 Looking around the valley today, with the state prison sprawling out and thousands of Latino, Mixteca, Trique and other indigenous people from the south laboring long hours in pesticide-strewn fields for meager wages, it was apparent to us that not very much has changed. There are many things that need to change. And we’re going to need your support to gather the strength to make the changes. So please stay tuned for updates and future calls to action and get in touch with us if you live in the Soledad area and are interested in helping. Thank you for writing this (and for doing this long, long walk). I, too, was horrified to discover bones in the parkinglot of Soledad when my sister, Louise Miranda Ramirez, took me there. I wrote the following piece, which is in Bad Indians: A Tribal Memoir (Heyday 2013). The Santa Lucia mountains thrust up sudden, tooth-like, ridge against turquoise sky, roots grasping this sweep of valley. The Mission Bell hangs from an iron post. White roses bask in the raked garden. The old mission lands grow broccoli now, vineyards drape along the mountains like jade scarves. 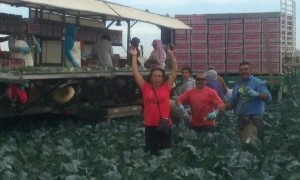 Brown workers from Mexico, El Salvador, Guatamala, picking since dawn. I wonder if the soil recalls their bruised Indian bones; I wonder if it ever forgot. It’s Saturday morning, and we have never walked so mindfully. We find bone fragments on paths, parking lot, edge of groomed green fields. Here is a finger joint, here a tooth. Here a shattered section of femur, here something unidentifiable except for the lacey pattern that means human being. Our children run to us with handfuls of ancestors they keep calling “fossils” because youth and privilege don’t let the truth sink in yet. It’s too big, too much to know: our relatives scattered on the earth where Mass is said once a month and for three hundred dollars you can baptize a baby in the old chapel beneath turquoise, pink, green and blue designs painted by our relatives. Chevy trucks and Mercedes drive over dispossessed white bones coming up from the parking lot bulldozed over the graveyard of Soledad’s Indians, grind them into steel-belted tire treads, carry them out to Highway 101, scatter ancestors to the wind. Our Lady of Sorrows weeps in her niche behind the altar, dressed in black, inconsolable. What has been done in her name? 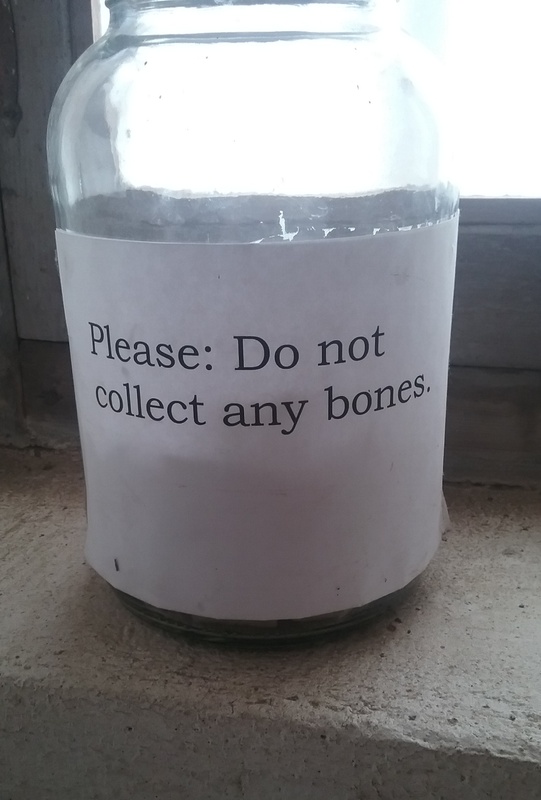 She doesn’t want to know. We gather this chipped harvest in our hands, pockets, cotton tobacco pouches, circle the Mission slowly, follow Louise, who found our language buried beneath her tongue, who places living words in our hungry mouths for us to swallow whole. James kneels, digs a hole with a flat sharp stone. Chris prays shyly: the old grandmother hums inside her skin. Ernie holds up the iridescent abalone shell, lets pale blue smoke bless this lonely air. The children hover like butterflies, taste the past without fear. Xu-lin, we say to our broken ancestors; xu-lin, sprinkling sage, mugwort and tobacco over the small grave. Xu-lin, we whisper as the earth takes back. Xu-lin, a plea and a promise: return. This needs to be rectified immediately. Such a sad,sad thing. How anybody can be so disrepectful!! Thank you Caroline Ward Holland for Walking. I am weeping as I read this. So powerful and so tragic. This lack of respect for the lives of the people who died there must stop. Pingback: G's view of the world | Do you know what really happened?